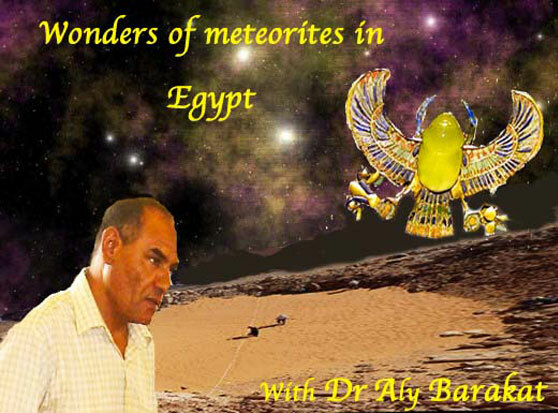 The Wonders of the Meteorites In Egypt. Guest : Dr Aly Barakat , geologist interviewed by Antoine Gigal. Dr Aly Barakat, egyptian geologist, General Director of the Egyptian Mineral Resources Authority, and General Director of the Geology Museum unravels for us Egypt's treasures and wonders through the discoveries he has made. He reveales how the Libyan glass was formed and shows the unexpected beneficial effects of meteorites for humanity. Be ready to have your minds blown away. Egypt - Geology - Meteorite - Desert - Libyan - Great Sand Sea - Mineral Resources - Mineralogy - Stones - Humanity - Tutankhamun - Hatchepsut - Pharaoh - Senemut - Treasures - Space - Earth - Planet - Crater - Impact - Gems - Diamonds - Museum - Antoine Gigal- Dr Barakat.